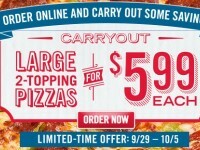 From now until August 16th, Domino’s is running a fantastic carry out deal: A 2-topping large pizza for just $5.99. 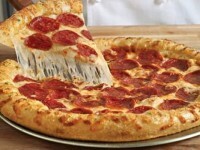 The deal is good for carry out orders only, and there is no limit to the number of pizzas you can get. You can order online (there is a link in the upper right corner of the website displaying the deal) or you can order the same deal over the phone. 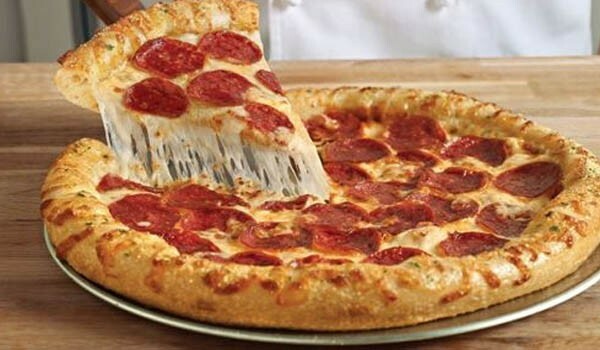 As a comparison, you can get a 3-topping pizza for $7.99 Monday through Thursday, but the regular price (which you’ll never have to pay with coupon codes) is about $14. As you can see, $5.99 is pretty fantastic.